By way of an introduction to these four-flute cutters I feel it might help to establish why Radian Tools came to be in the first place. David Gray and Dan Allen are essentially tool users; a cabinetmaker and engineer to be precise, so you could say they have more than a vested interest in the outcome of their products. There is something tremendously satisfying about creating something from scratch that performs better than you had hoped, and this is the motivation behind their range of cutters. We were certainly intrigued at F&C to find out if four flutes are better than two. We ran three cutters: a 19mm dual guided trimmer, a 35mm rebate set and a 12.7mm roundover/ovolo on a table set-up. Now, with four edges in play, a couple of things change at the cutting face: material is removed in smaller chips and more frequently, and the capacity to eject waste material is reduced by half. 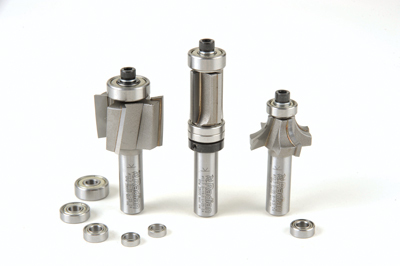 The change in tool edge geometry is not proportionately linked, so compensating for this is crucial to getting the best out of these cutters. Once mastered, however, we were able to get some great results. 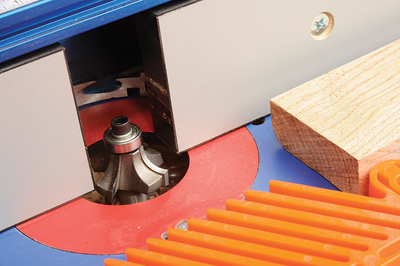 Without going too much into the technology behind router cutters it's important to understand that there are four main variables affecting the optimum performance for machining timber with a router: feed rate, depth of cut, tool rotation speed and material characteristics. In all cases we found that a slower feed rate was the best approach - just as it is with two flutes - and that lighter cuts proved more successful. So where are the benefits you ask? Well, if it's a smooth finish you're after there was a noticeable improvement especially with the roundover/ovolo. Compression marks - ripples - on the surface were greatly reduced, meaning less sanding to get to a finish. Having four edges also cuts down on heat build up, reducing the risk of burn marks and prolonging the life of the tool. For me though the most noticeable increase in performance came from working with awkward timbers - maple (Acer campestre) and cherry (Prunus spp.) in particular - where the grain can tear out leaving unsightly blemishes. For the majority of tabletop work the advantages are less obvious because the technique generally offers better support and control of the workpiece, but for free-hand work, I think you will see a marked improvement. Incidentally, the rebate cutter could remove a full 6.5mm in a single pass to a depth of 22mm, with a faster feed rate, without unduly straining our machine. The finish was fairly bumpy though. In summary, I think these cutters represent good value if you are prepared to invest a little time finding the combination of settings that works best for you.